Hue 2.0 is now Apple HomeKit certified, which allows the lighting system to work within Apple’s Internet of Things framework. You know, that thing that wants to turn regular houses into smart houses, but voiced by Siri and not Katey Sagal. Although that sounds very future-y, right now it’s pretty limited. You can basically control your Hue lights with your iPhone’s built-in voice assistant instead of popping into a separate app. It’s definitely cool, and if you’re not a big fan of pressing buttons on your phone, then it will make your life somewhat easier. For instance, you can change your lights to red (or any color) if you want to pretend to have a photography dark room or make a spooky Halloween scene. While Hue’s app only lets you control your lights, many third party apps like Elgato’s Eve can funnel your lights and other smart devices, like thermostats and locks, all in the same place. That makes it easier for you to just ask Siri to put your home in “lock down” mode when you’re leaving rather than physically using a key. Hue 2.0 goes on sale tomorrow, but some sites like Amazon have already spoiled the surprise with preorder information. The bridge itself will cost $60. Fortunately, for those who have already bought Hue products, that’ll be further discounted by $20 through the Hue website. 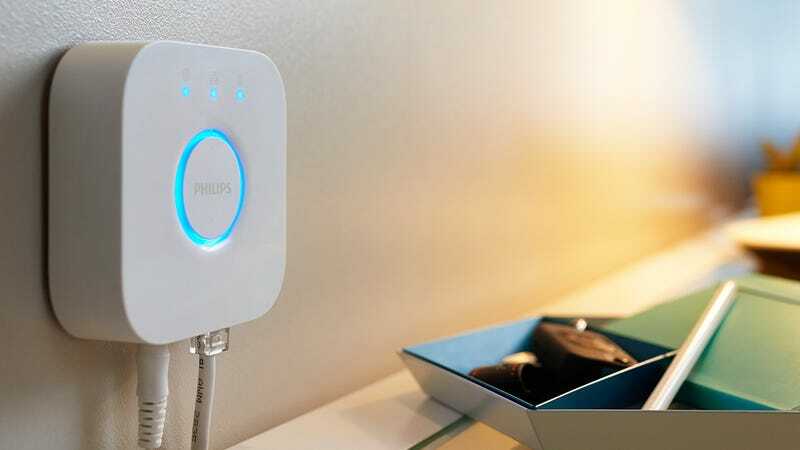 But if you like your current Hue system, unspoiled by AI voice integration, Philips will also continue supporting its first-gen hardware. Hue 2.0 isn’t a large improvement on the original. But if you always wanted to live out your deep-seated fantasies of “talking” to your house—or at the very least your lightbulbs—then it just might be worth it.